What do these do on my 81? Question...what do these two vacuum switches do or control on my 81 Vette? Few years ago I did remove the EGR, Air Pump and Cat Converter without any negative effects with engine performance and to further clean-up the engine area I would like to delete these two switches that are mounted to an arm that bolts to the rear carb-stud passenger side and plug the vacuum lines. Any feedback as to what these two vacuum switches do? Last edited by Hamerdown; 07-10-2018 at 10:25 AM. Are those lines going into the intake? 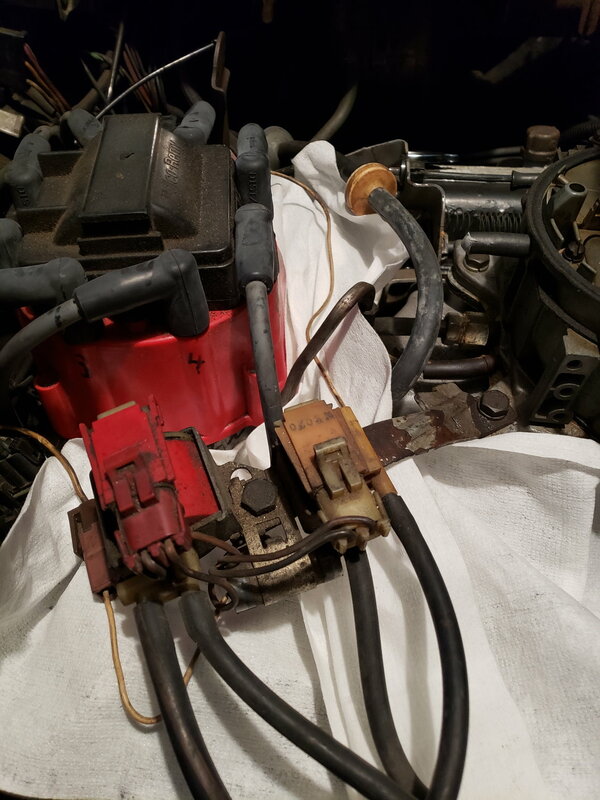 On my 77 the vac lines behind the carb that connect to the intake are for the auto transmission and headlights. Hard to tell the orientation with the towel in the pic. One is for egr so since you've removed that it does nothing. Can't remember about the other one. Possibly nothing as well. Can you trace the lines and see what they're connected to? You can safely remove both of those since you have already removed the EGR and air pump. I have removed them on my 81 with no ill effects. One is for the EGR and I believe the other is for the heat riser. Ok so here's another pic...I use the white napkins to highlight the part. All vacuum hoses leaving that contraption are blocked off and yes one hose did go to the deleted EGR. 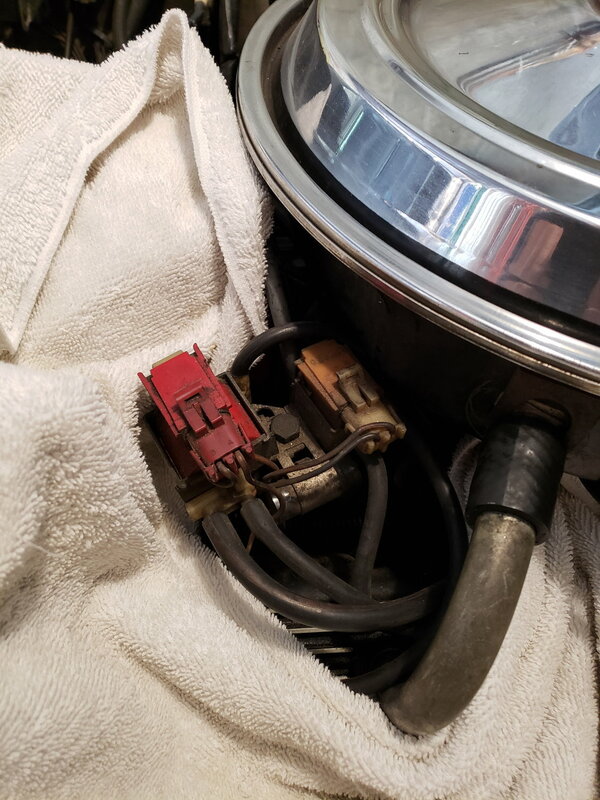 Also, notice the two TAN wires...they both come out of what looks like an *old condenser* for a points distributor that mounts under those two electric (whatever they are). One side the Tan wire exiting the condenser looking thing is going to the firewall and the other side the Tan wire exits and goes to one of the distributor plugs on the "TACH" side. So, will anything get messed up if the tan wires are detached? Last edited by Hamerdown; 07-10-2018 at 05:39 PM. The tan wires are actually white. The condenser is the tach filter. You'll want to leave that in place. Thanks Ant, just what I needed to know! I'll mount the Tach filter to the arm coming off the carb stud and lose the rest! Both solenoids control the EGR. I will take them if you choose to throw them away --- reasonable recompense considered. Just PM me. Last edited by wajulia; 07-11-2018 at 03:30 PM. One solenoid applies vacuum to the EGR, the other releases the vacuum. Good to know. Egr on my 81 had been removed when I got it. So no need for me to look into how it works. If and when I ever decide to sell my 81 I have been holding on to the components removed 'if' the next owner way want them. However if something changes I will certainly let you know...thanks! Last edited by Hamerdown; 07-11-2018 at 09:41 PM. Quick Reply: What do these do on my 81?